How did life begin on Earth? The fact is that no one knows the answer yet, and it remains one of the primary unsolved questions of biology. We may never know with certainty because life began on Earth nearly four billion years ago. The events that initiated life no longer occur, and even the conditions of that the early Earth are not known with any certainty. We do know one thing with reasonable certainty: Even bacteria, the simplest forms of life today, are so complex that they could not have appeared spontaneously on the early earth. More likely there were even simpler forms of life that required several hundred million years to evolve into bacterial life, complete with deoxyribonucleic acid (DNA) genes , metabolic pathways, ribonucleic acid (RNA) machinery, and protein catalysts . The first life probably appeared several hundred million years after Earth was formed as a planet in the early solar system 4.5 billion years ago. There are many lines of evidence that support this statement, but the simplest to understand is the fossil record. Even bacteria leave fossils, and such micro-fossils were discovered in Australian rocks that are about 3.5 billion years old. Something else scientists know with certainty is that Earth was very different when life first began. For example, the large number of craters on the moon's surface were produced by giant impacts of comets and asteroidsized objects that were part of the accretion process by which the moon formed. The collisions continued until about 3.9 billion years ago. During that time Earth was also being hit by objects many kilometers in diameter, and the first life could not have begun until the violent bombardment ceased. Therefore, scientists estimate that the simplest form of life probably was present about 3.8 billion years ago, and over a few hundred million years evolved into the bacteria that left the Australian microfossils. What sorts of chemical and physical processes might have produced the first forms of life? A brief summary of the properties of life today can tell scientists a lot about how life began. All life is cellular, from single-celled bacteria to multicellular human beings. Cells have anywhere from a thousand or so genes (bacteria) to thirty thousand genes (human beings) and each gene carries the information to synthesize a specific protein. The synthesis of proteins requires energy and occurs on ribosomes . RNA carries genetic information transcribed from DNA to the ribosomes where it is used to direct the synthesis of proteins. The most basic activity of life is a process called polymerization. During this process organized systems of molecules use energy and nutrients to grow by linking smaller molecules into larger molecules. The chemical reactions involving energy and nutrients are collectively called metabolism , and the individual reactions of metabolism are catalyzed, meaning their rates are increased in a controlled way by specific molecules (proteins, in the case of all living organisms). Second, a living organism has the potential to reproduce itself at some point in its life cycle. Third, because mutations can lead to variations among individuals, populations of living organisms can evolve over time from generation to generation, responding to changes in their environment through natural selection. When one talks about the origin of life, one therefore must think about how organized systems of organic molecules could have appeared on the early Earth, and how they could take on the basic properties of the living state defined above. Louis Pasteur was the first scientist to think about how life can begin. In 1865, Pasteur showed that bacteria do not occur spontaneously in sterile culture media, and concluded that life can only appear from preexisting microorganisms. This view was accepted by the scientific community for more than fifty years, until a young Russian scientist named Alexander Oparin realized that preexisting organisms could not have been present on the early earth, which must have been sterilized by the heat of its formation. And yet, somehow life began. Oparin suggested that organic molecules could spontaneously aggregate into larger structures he called coacervates, one of which could have happened to have the basic properties of life. In general, Oparin's proposal about aggregation remains a viable hypothesis for the origin of life, but his coacervates are no longer considered to be plausible models of the first forms of life. The next advance came with a better understanding of chemistry and biochemistry. Life as it is known in the twenty-first century requires organic compounds containing carbon, hydrogen, oxygen, nitrogen, phosphorus, and sulfur, and these are present in four kinds of biochemical compounds and their polymers: amino acids and proteins, nucleotides and nucleic acids, simple sugars and polysaccharides like starch and cellulose , and lipids , which self-assemble into cell membranes. Were such compounds available for the origin of life? The answer seems to be yes. Even today, certain meteorites fall to Earth that contain thousands of different organic compounds, including amino acids, synthesized by nonbiological processes. Scientists also know from the early experiments of Stanley Miller and Harold Urey that organic compounds can be synthesized under simulated prebiotic conditions, so it seems reasonable to assume that simple organic compounds were present on the early Earth. Now one can think about the actual process by which a living organism could appear on the early Earth. An important point to understand is that some organic molecules have properties that allow them to spontaneously organize into larger structures. A common example is the self-assembly of soap molecules into soap bubbles. A living cell resembles a microscopic bubble, and the same forces that produce a soap bubble also stabilize the membrane that surrounds all living cells like a skin and separates the cytoplasm from the outside world. It is easy to imagine that such microscopic bubbles were present on the early Earth, and it has been shown that some of the organic compounds in meteorites can in fact produce bubblelike structures. Although the assembly of microscopic membranes from soaplike molecules is interesting, two other self-assembly processes are equally important. The first is that the long strings of polymerized amino acids called proteins can fold up into tightly packed balls that represent the functional proteins, such as enzymes . This folding process occurs in all cells as proteins are synthesized from amino acids on ribosomes. If proteinlike molecules were somehow produced on the early Earth, they would also have the capacity to fold into a variety of structures, some of which might act as catalysts. The second self-assembly process is that long strings of polymerized nucleotides called nucleic acids can wind together into double stranded structures. The famous DNA double helix is an example, and this is the only way that scientists know that a molecule can reproduce itself. That is, one strand of DNA acts as a template , and a second strand is produced on the template when nucleotides bind to it and are then linked together. All life today depends on this process, which is called replication, and the earliest forms of life must have had a primitive version incorporated into their system of molecules. 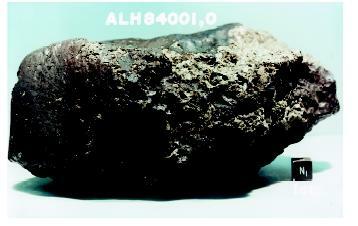 A meteorite from Mars, thought to be about 4.5 billion years old. There is a possibility that life similar to bacteria, the simplest form on Earth today, could be present on Mars. solar system. These self-assembled systems can be thought of as countless natural experiments that occurred all over Earth for hundreds of millions of years. The next step occurred when a few of the microscopic systems had the particular set of molecules and properties that allowed them to capture energy and nutrients from the environment, and use them to produce larger polymeric molecules. In the next step toward life, one of the growing systems contained molecules that could be used as templates to direct further growth, so that a second polymeric molecule was in a sense a replica of the first molecule. DNA synthesis in cells is a primary example of molecular growth by polymerization, and also demonstrates how the information in one molecule can be reproduced in a second molecule. Because these processes can be reproduced under laboratory conditions, one can be reasonably certain that they are plausible reactions on the early Earth, even though scientists don't know yet how the first long polymers were produced. The last step in the origin of life is that one or more of the growing, replicating systems happened to find a way to use the sequence of monomers in one molecule, such as a nucleic acid, to direct the sequence of monomers in another kind of molecule such as a protein. This was the origin of the genetic code and the beginning of life. It also marked the beginning of evolution, because molecular systems composed of two different interacting molecules like nucleic acids and proteins have the potential to undergo mutational change followed by selection. It is amazing to think that this complex set of events occurred spontaneously on the early Earth, and that life was up and running only a few hundred million years after Earth had cooled sufficiently for liquid water to exist. And yet, this seems to be what happened, and if it happened on Earth it could also happen elsewhere, since the laws of chemistry and physics are believed to be universal. This larger understanding of life has led to a new scientific discipline called astrobiology, which is defined as the study of life in the universe. Could Life Have Begun Elsewhere? Could life have begun elsewhere? The simplest place to look is in the solar system and compare other planets with Earth. Scientists now have a better understanding of where life exists on Earth, and it is much more widely distributed than we might have guessed. Bacterial life exists over a remarkable temperature range, from near 0°C (32°F) on melting snow to over 115°C (239°F) in submarine hydrothermal vents. It exists in acidic environments as strong as battery acid or as alkaline as household ammonia. Bacterial life exists in the dark, in the absence of oxygen, and has even been found growing in the radioactive water of nuclear reactors. In fact, the only constant is that microbial life requires liquid water, and if liquid water exists elsewhere we might expect that life could have started as it did on Earth, and may even still be flourishing. Where in the solar system might one find liquid water? There are only two places that scientists know of: Mars and Europa. Mars certainly has water, but in the form of ice. Liquid water cannot exist for long on the surface of Mars, due to the cold temperature and low atmospheric pressure, but it could be locked up in ice beneath the surface, just as water is present in the permafrost of Arctic tundras. Recent images from the Mars Global Surveyor clearly show that liquid water occasionally breaks through the ice and pours down steep slopes on the edges of craters. Europa, a moon of Jupiter about the size of Earth's moon, also has water in the form of a thick sheet of ice, and beneath the ice is a global ocean of liquid water. On both Mars and Europa there is a distinct possibility that life similar to bacteria could be present, and future space missions may finally answer the age-old question: Does life exist elsewhere? Malin, M. C., and K. S. Edgett. "Evidence for Recent Groundwater Seepage and Surface Runoff on Mars." Science 288 (2000): 2330–2335. Miller, S. L. "Production of Amino Acids Under Possible Primitive Earth Conditions." Science 117 (1953): 528–529. Miller, S. L., and Urey, H. C. "Organic Compound Synthesis on the Primitive Earth." Science 130 (1959): 245–251. Europa was discovered by Galileo Galilei in 1610. This moon of Jupiter is the sixth largest moon in our solar system. Pasteur was not the first. His experiment was used to disprove spontanoeus generation, a hypothesis to how speciation occurs and how life began. Since the dawn of time man has thought about how life began. Even saying that Pasteur was the first to try and disprove spontaneuos generation is wrong, as Spallanzi was before him and REdi before him, but both were not accepted as beleives of abiogenesis found false ways to invalid their experminets.